GBPJPY will be volatile today and GBP will be massively under the influence of the issues around Brexit. 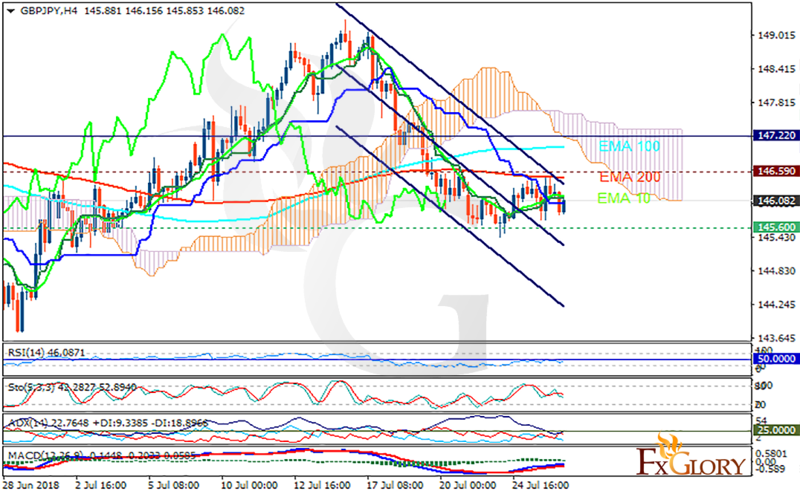 GBPJPY has been moving with bearish bias but it looks as if there is going to be a weak reversal soon. The support rests at 145.600 with resistance at 146.590 which both lines are below the weekly pivot point at 147.22. The EMA of 10 is moving horizontally in the descendant channel and is below the EMA of 100 and the EMA of 200. The RSI is rising towards the 50 level, the MACD line is above the signal line in the positive territory and the Stochastic is showing downward momentum. The ADX is showing sell signal. The price is below the Ichimoku Cloud and above the Chinkou Span. The Tenkan-sen and the Kijun-sen are both showing a horizontal trend. Short positions are recommended towards 145.